Irish Wolfhound Bursas are swellings which can occur on the boney parts, such as elbows, hocks and boney bottoms. There can start as a small squishy lump and grow. They seem to grow quickly and disappear slowly! Q. My Irish Wolfhound has a swelling on the elbow. What is it? A. This is known as a bursa (Hygromas). These swellings are filled with fluid, normally occurring over a bony area, such as elbow, hocks the top of the head and boney bottoms. They will disappear almost as suddenly as they have appeared of their own accord. Unless they become infected, hard, extremely large, hot to the touch, or causing the dog pain, or lameness, do not drain or otherwise interfered with the bursa. Rather annoyingly they can hang around for several months, usually dispersing given enough time. Anecdotally success may be achieved by treating bursas, on elbows and bottoms, with homeopathic Calc Fluor 6c. Some use it in conjunction with Apis Mel 6c. Sometimes the response is good, and can be within two weeks of starting treatment. Dosage: two tablets every two hours for six doses. Next two days- two tablets morning and evening. Thereafter two tablets once a day. Some owners say they have had a good success rate rubbing haemorrhoid cream on the bursa! Your vet will almost certainly suggest draining the bursa and then fill with antibiotics and anti-inflammatories. Some surgically removed the sac and stitch. Prevention is better than cure. Ensure that your hound has a soft bed to lie/sleep on. However despite this precautionary measure, dogs can still get bursas. They flop down on to hard surfaces no matter what you try to do to prevent it, preferring the cold tiles of the kitchen floor! Some breed lines seem to have a predisposition to them, this could be because they have the same shape and boney areas or they have the same personality in the way they throw themselves around and flop to the ground. Without doubt they are trauma related. Unless they become infected, hard, extremely large, or causing the dog pain, or lameness, I do not drain or otherwise interfered with the bursa. Rather annoyingly they can hang around for several months, usually dispersing given enough time. Success may be achieved by treating bursas, on elbows and bottoms, with homeopathic Calc Fluor 6c. Some use it in conjunction with Apis Mel 6c. Sometimes the response is good, and can be within two weeks of starting treatment. Dosage: two tablets every two hours for six doses. Next two days- two tablets morning and evening. Thereafter two tablets once a day. Some owners say they have had a good success rate rubbing hemorrhoid cream on the bursa! Have some patience and unless your hound is in pain, these annoying swellings which seem to appear in an instant will disappear slowly in their own time. Sometimes they just burst, which is not as bad as it sounds, and this allows the release of the fluid. If this happens bathe in warm salt water, or in a warm diluted hibiscrub solution, in other words keep clean. At this stage it is best you visit your vet, as you may need antibiotics, and your vet may want to put in a few stitches, it is normal they will leave the lower part open so drainage can take place. Unless the bursa bursts or becomes becomes infected, it is best to treat conservatively and not invasively. However always check with your vet if you are unsure. As an owner, it is important to be aware of the vital if not subtle signs of onset, because the earlier pneumonia is recognised, the better the chance our deep chested hounds have a full recovery. Once an infection develops deep in the lung tissue, it becomes tough to control, even if the correct drug is found. The single most important thing about pneumonia recovery is to catch the symptoms very very early. So any slightest concern or suspicion that your hound may have pneumonia then please of straight to your vets. Ps. remember the thermometer is your friend! Kennel Cough does the rounds, and our hounds don’t do too well with this virus /bacteria when it does. It’s an upper respiratory infection. The condition is also known as tracheobronchitis and affects the lungs, windpipe and voice box. It is highly contagious. Some of the signs, can be, coughing up frothy liquid, coughing, high temperature, loss of appetite, dehydration, general unwell appearance, and standing with their neck extended and hanging low. The vet is your first port of call, do not wait. You will need a/b’s and maybe rehydration. Acting quickly against this is the best option, when caught in the early stages the recovery is very good. Again the thermometer is your best friend here. Oralade is great to have in the cupboard for rehydration, and coconut oils soothe the throat if the cough appears. Above anything else take your wolfhound to the vets, they don't do well with respiratory problems and it needs to be caught quickly before infection takes hold in the lungs. It can convert to pneumonia very very quickly. Torsion of the Spleen and/or blockage in Stomach. Symptoms almost identical to those of bloat/stomach torsion. All dogs sometimes make themselves sick after eating grass or whatever and some do pick up viruses or stomach upsets causing them to be sick, but this vomiting is different. It usually includes bringing up large quantities of stomach bile, maybe the last meal they had and often water they have just drunk. If your dog is sick twice and it's not self-inflicted then don't worry too much, but keep an eye on them, more than twice in a few hours then sit up and take notice - whatever you do at this stage if it is late DO NOT GO TO BED thinking it will be fine by morning, chances are you will have a dead dog by morning. The inability to keep water down is a dead giveaway usually and if you spot any blood in the vomit then run for the phone immediately. I am always very wary of a deep-chested breed who displays stomach issues as they are so prone to torsion, bloat etc. and these are KILLERS. The other disturbing thing is the speed at which a condition can develop, with our 2 St Bernards we are talking a matter of only 2 hours from the first signs (vomiting 3 or 4 times) to the condition becoming critical. If you're not used to checking your dog then please do so, even if it is just so you know what is normal and what isn't. In both these conditions you are looking for a hard mass in the abdomen that should not be there. Don't want to patronize anybody, but to make things really simple it safe to say that the front half of the body nearest the head is where the lungs, heart etc. 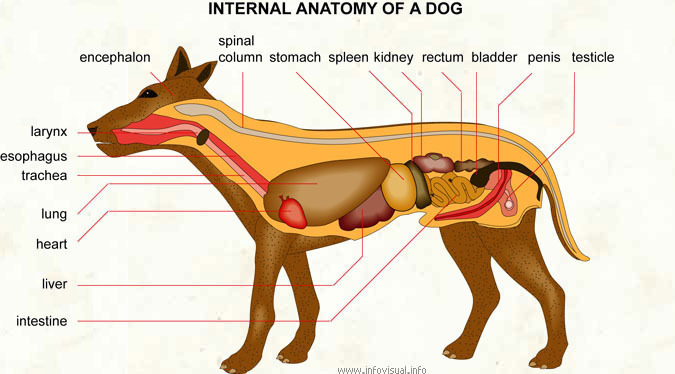 are situated and they are protected by the ribcage, but after the ribcage going back towards the tail end of the dog are the other organs including the stomach, spleen and intestines and these are all "squidgy". Essentially you hold your hand against one side of the abdomen whilst using the other hand to gently push along the other side of the dog, feeling for anything hard. If you did not hold one hand against the other side then any mass could just move over to the other side of the dog and you would not notice it (makes sense really). You repeat the process swapping your hands over to the other side of the abdomen - bet you feel like Dr Kildare now! This is another possible symptom but not as clear as the first two and not that reliable as an indicator. Would you know what colour your dog’s gums are normally anyway? So imagine you're already panicked and you're trying to decide if the dog's gums look pale or not - there is no shade chart for this or Dulux colour chart! You can always tell when your little furball is "off-colour" or not their usual "bouncy self". I find a lethargic dog very worrying at any time and these cases are no different - if they look not right, then they are not right! One of my dogs actually collapsed on the garden when he had a blockage in his stomach which had become ravelled in the intestines and, although he made it through surgery, he died a few hours later. This is also one of those symptoms that is really difficult to convince a vet about most of the time, but it is always one of the best personal indicators for a poorly giant breed - stick to your guns when on the phone to the vet about this one. Again this can just mean they are hot or they have been running about, but also indicates a raised temperature, distress or serious issue. Might also be worth checking your dog’s normal temperature anyway, so you’re aware of what that is (usually a dog’s temperature varies between 37.1 and 39.1 degrees Celsius). Whilst attending a Breeder Education Seminar in November 2013 Nick Sutton gave a talk regarding canine poisons and particularly the most common reported items that vets and the Veterinary Poisons Information Service (VPIS) had listed. The following article is based on notes taken during that lecture and the subsequent question and answer session with full credit going to Nick Sutton for the contents and information. This is not an exhaustive list, but if you are unfortunate enough to be in the position where your dog may have been poisoned veterinary advice should always be sought, particularly before administering any treatment that may cause harm to your dog. Definition: A poison is a chemical which, when introduced, has an unwanted effect. Anything can be poisonous to an animal if it is exposed to enough of it. Industrial Chemicals: Acids/alkalis, dyes, solvents Drugs of Abuse: Cannabis, cocaine, ecstasy, heroine etc. There are different ways in which animals can become exposed to any type of poison; ingestion, inhalation, eye contamination, skin contamination, injection, bites and stings, other routes. For the purposes of this article we will only concern ourselves with 3 common poisons that generally cause the most level of concern to dog owners. Chocolate: Not surprisingly the instances of possible chocolate poisoning reported to vets peaks at Christmas and Easter! All chocolate contains a chemical called theobromine to some degree, which is similar to caffeine in many ways. Theobromine stimulates the myocardium and central nervous system and has symptoms that look very similar to caffeine poisoning. If your dog has consumed more than the above then contact your vet immediately and they will advise as to treatment, which usually consists of administering emetics to make the dog sick and also repeated doses of activated charcoal to ‘absorb’ the chemical. Never try to induce the dog to vomit at home unless your vet advises you to do so. As you can see from the difference in the amounts (2.2 kilograms of white chocolate compared to only 1.25 grams of dark chocolate), darker chocolate contains far more theobromine than white or milk chocolate. Therefore an 80kg Irish Wolfhound could consume a whopping 176kg of white chocolate and not suffer any long lasting effects, but an average 100g bar of dark chocolate could be disastrous! These are another example of poisons that vary from dog to dog and some animals can tolerate higher amounts whereas other dogs may consume 1 fruit and suffer terrible effects. Symptoms appear between 6 and 24 hours after consumption and initially show as gastro-intestinal problems (vomiting, diarrhoea etc. ), but later renal failure can occur. Vets treat this type of poisoning by again inducing vomiting and giving activated charcoal, as well as aggressive IV fluid therapy for 48 hours and renal function of the dog will be monitored for at least 72 hours. Not surprisingly, instances of dogs consuming these foods also peaks at Easter and Christmas and during these holiday seasons it is easy to forget about the hidden dangers for our dogs which are contained in foods we love. Adders: the Adder is the only venomous snake we have here in the UK and they live in the South, Southwest of England, Scotland and coastal regions with sand or sandy dunes. An Adder has black zigzag marking on its body and an X or V mark on its head and the eye has a vertical slit. Adders hibernate over Winter and emerge in early Spring and mate between April and May. Dogs that have been bitten take around 5 days to recover and most make a full recovery with no long lasting effects. Dogs that are suspected of being bitten by an Adder should be kept still and quiet and the bite should be left alone and the dog observed for a minimum of 12 hours. Your vet will administer IV fluids and contrary to popular belief, anti venom is not usually administered as it is difficult to get hold of and some dogs can react badly to it. If you suspect your dog has been poisoned, asess the situation and don’t panic! Based on the information you provide the vets and scientists will be able to tell you if you need to go to the vets for immediate treatment or whether we can save you the trip. They have experience of thousands of toxic substances in all animals and cover everything from human drugs, household and garden products, plants, agricultural chemicals to venomous bites and stings. They are veterinary poisons specialists and therefore, regrettably, cannot help with any other veterinary enquiries unrelated to poisoning. Whilst attending a Breeder Education Seminar in November 2013 we were treated to a very informative talk by Mrs Susan Paterson, a specialist in veterinary dermatology, practising at Rutland House Referrals, St Helens Merseyside. Sue gave an excellent lecture on the most common incidents of dogs/puppies scratching, the likely causes and how often these conditions can be treated by owners and do not require veterinary treatment. The following article is based on notes taken during that lecture and the subsequent question and answer session with full credit going to Sue Paterson for the contents and information. This is not an exhaustive list, but merely the more common conditions that dog owners come across and naturally, if as an owner you are not sure of the cause, veterinary advice should always be sought, particularly before administering any treatment that may cause harm to your dog. For the purposes of this article we will only concern ourselves with the first 3 categories listed above as they are typically the conditions that can be dealt with at the early stages by most dog owners, without the need for veterinary intervention (whereas congenital diseases and immune mediated diseases are definitely the realm of the veterinary specialist). Sue Paterson went on to state that she now treats over half her patients with topical treatments such as shampoos and powders, rather than medication such as antibiotics and steroids. She was concerned that many general practice vets prescribe these medications all too readily and that such medication is often ‘overkill’ for these minor conditions. In addition, the excessive prescribing of antibiotics, much as with humans, is now causing problems when treating dogs as ever increasing stronger drugs are now having to be used due to overuse for minor conditions and also more drug-resistant strains of bacteria appearing. Fleas are a common problem for most warm blooded animals and particularly domestic pets. If your dog or puppy is scratching and appears itchy then usually fleas are the first thing to check for and they can be seen either by checking through the dogs coat or by combing through the fur and onto a piece of paper. Fleas vary in size from 1/12 to 1/6 inch in length and they can jump several inches vertically and up to 16 inches horizontally. They thrive in warm conditions such as on the dog itself, also on the dog’s bedding and the areas where the animal typically walks. The adult fleas feed on the blood of their host (in this case your dog) and they then lay eggs and these eggs can hatch in as little as 2 days and become flea larvae, which look like maggots. The larvae feed on the faeces of the adult fleas, which contains undigested blood and then the larvae form cocoons, from which new adult fleas emerge in 1-2 weeks. This cycle means that for every adult flea you can see there will be many more eggs, larvae and cocoons that you cannot see and so all of the environment must be treated and not just the dog itself. There are many products on the market to treat fleas and they come in tablet, pipette (spot on), powder and spray forms. Brand names such as Frontline and Effipro will be familiar to many of us and are typically Fipronil based treatments (Eliminall and Flevox are other popular brands), whereas Comfortis tablets are Spinosad based and only target fleas rather than other parasites. Whatever product you decide upon remember to treat all areas of the dog’s environment including bedding, carpets, floors, collars and leads and furniture. Repeat applications of products may also be required to eliminate all of the emerging larvae and adult fleas during different stage of the cycle. Demodex is a type of mite that lives in the skin of its host and so it cannot be seen with the naked eye, but it can cause a severe reaction in dogs and particularly in young puppies. The demodex mites block the pores of the skin and when you part the fur back and look at the skin it often looks like little blackheads/spots to the naked eye. The mite is actually part of the normal fauna of the dog and so is always present in small numbers on a healthy animal, but when demodex exceeds normal levels the results can be very dramatic with large patches of affected skin and a lot of fur loss. In severe cases the infestation can become so bad that the dog does not respond to treatment, resulting in the dog being euthanized, but this is the exception rather than the norm and usually dogs are treated very successfully and never suffer a repeat of the infestation. Treatment for demodex is fairly straight forward, once the mite has been identified, but in order to do so skin scrapings must be taken to confirm the presence of the demodex mite. Scrapings must be done prior to any steroidal treatment being administered, otherwise the scrapings will be useless. Treatment of demodex is typically done with either Aludex which is an Amitraz based product and is a topical wash applied to the dog’s skin. Panomec is another alternative treatment for demodex and it has Ivermectin as its active ingredient. Ivermectin is not commonly given to dogs and is typically used for livestock treatment and as such it is injected into the animal on a dosage according to body weight. Therefore this treatment should only really be considered in severe cases and should be on vet recommendation only. The Sarcoptes mite (more commonly known as scabies) is extremely itchy and can cause severe symptoms in dogs and especially puppies. The mites burrow into the skin of the host and form tunnels inside the skin, where they lay eggs which in turn hatch out larvae. Foxes are typical carriers of scabies and can also succumb to its worst effects. The mites cause severe irritation and make the dog scratch profusely causing fur loss and a lot of trauma to the skin, so secondary infections are common place. If left untreated a scabies infestation can spread across the dog’s entire body causing horrific damage to the skin and total fur loss, but usually the symptoms are spotted by owners in the earlier stages and one of the key signs of Sarcoptes is fur loss around the perimeter of the ears. Dogs with scabies are usually treated with products such as Advocate or Stronghold, but treatments need to be repeated every 2 weeks for a total duration of 6 weeks in order to eliminate the adult mites, the nymphs and the larvae and to break the life cycle of the Sarcoptes. Cheyletiella are yet another revolting looking mite and they live in the top layer of the skin and feed on the skin’s keratin. However, unlike Demodex or Sarcoptes, these mites lay their eggs on the host’s hair follicles and so they can be seen with the naked eye and are fairly easy to detect. As with fleas, the owner should use a comb to part the fur and then comb the fur from the root to the end and allow the contents of the comb to drop onto a piece of paper. The reason for this mate being commonly referred to as ‘walking dandruff’ should then become very obvious! Treatment for dogs with Cheyletiella is typically done with Fipronil based products such as Frontline spray (see above section on fleas), but other topical treatments can also be used including sulphur based shampoos. I have decided to include a short section at this point about ears and also to dispel a common myth that many ear irritations found in dogs are caused by ear mites. Sue Paterson stated categorically in a discussion after her talk that she frequently sees dogs in her clinic that were misdiagnosed as having ear mites – she states that ear mites are actually quite rare and usually the dog has an allergy issue. Another interesting aspect to treating dogs with ear irritation is the over-prescription of medicated ear drops/cleaners. Often a vet will prescribe Canaural drops or Surolan to treat nothing more than a waxy ear. These proprietary ear medications contain 3 things; a broad spectrum antibiotic, a targeted antibiotic and a steroidal anti-inflammatory. Therefore they are not suitable as a general ear cleaner and frequently, depending upon the cause of the ear irritation, vets actually want to use just one of the 3 medicated ingredients and not the other 2. Sue Paterson recommends either Cleanaural or Otodene for general maintenance cleaning of ears as they do not contain any antibiotic or steroids. She also strongly discouraged owners from using powder in dogs’ ears, particularly down the ear canal as these can actually make ear conditions worse; the natural mechanism of a dog’s ear transports foreign bodies and irritations upwards and out of the inner ear to the outer ear, but powders can coagulate in the inner ear and form a ‘plug’ which stops this natural mechanism from working. If you still use a powder such as Thornit in the ear, (which I would strongly recomend you don't now having attended this seminar), then please ensure that the powder is rubbed into the skin of the ear flap and does not drop down the ear canal. Impetigo is a mild skin infection that affects the surface of the skin and is usually seen in puppies and dogs under 12 months of age. The infection occurs in between the pores rather than in the pores of the skin themselves and typically shows as pus filled blisters on the underside of the dog (but can also be seen on other parts of the body). Like many infections the rash itself is not difficult to eliminate, but it does cause the dog to itch and left untreated the dog or puppy can then abrade the skin and go on to cause pyoderma which will need more aggressive antibiotic treatment. Therefore dogs and puppies should be checked regularly for any signs of skin irritation. The impetigo rash can be successfully treated with shampoos such as Etiderm, Malasseb, Paxcutol and Malacetic. Initially bathe the area with the shampoo twice a week for 2-3 weeks and also identify the cause of the flare-up so check bedding and the dog’s environment for unsanitary conditions. This infection is extremely itchy and therefore can cause the dog or puppy to scratch and abrade their skin and the resulting trauma can lead to nasty bouts of pyoderma. Malassezia is a yeast that is commonly found on a dog’s skin and inside its ears, but some dogs can end up with an overgrowth of the yeast and it can cause widespread trauma to the skin in a similar way to a systemic Candida infection. Typically dogs that are stressed or have a compromised immune system can fall foul to malassezia. Initially it starts in areas such as the feet, inbetwen the toes and pads and also inside the ears and then it spreads to other areas of the body. The yeast likes warm, damp areas to breed and multiply so any parts of the dog that do not get as much airflow to them can be a site for malassezia. The skin of the dog becomes itchy, oily, scaly and has a greasy odour to it, with fur loss and reddening of the skin too. Certain breeds do appear to have a genetic predisposition to this infection and West Highland White Terriers are one of those breeds who can suffer horrendous bouts of malassezia. Treatment needs to be two-fold and treat both the external and internal symptoms, much in the same way as a candida infection. The external rash symptoms can be treated topically with shampoos such as Malasseb and even T-Gel (human shampoo, but ensure it is diluted down), but another effective bath is sulfurated lime, also sold as Lime Sulfur Dip. Sue Paterson recommends bathing every day for the first week, then every 2 days, then every 3 days and so on until the rash disappears and then just be aware and check for any signs of reoccurrence and a weekly maintenance bath will also help prevent the problem coming back. The internal aspect of the infection should also be treated by amending the dog’s diet to exclude any grains and also supplementing the animal with a strong probiotic and an anti-fungal such as coconut oil or olive leaf extract. Ringworm is another common infection and is fungal in nature and invades the hair and hair follicles and produces round rings of hair loss with crusty, scaly skin in the centre and a red ring around the outer edge. It is usually seen in puppies and young adult dogs and is not a particularly itchy condition to being with, but secondary infection can be an issue if the ringworm is not treated and the dog goes on to cause trauma to the skin. However, ringworm is sometimes diagnosed by mistake when actually the lesions are localized Demodex or infected hair follicles, so care must be taken when analysing the lesions and if in any doubt, seek veterinary advice. Treatment for dermatophytosis is similar to other fungal infections and topical treatment with shampoos, sulfurated lime or Nizoral should be utilised to clear up a first stage infection, but again, if secondary infection has occurred through trauma then antibiotic treatment may also be required. Allergies in dogs seem to be more common than ever before and the symptoms can present in very similar ways to parasites and infections. Also, some dietary issues can contribute to other conditions such as systemic candida and malassezia and therefore diet plays a large part in the well being of our dogs and puppies. The first step in diagnosing a food allergy is to rule out other causes of reaction, particularly parasites and infections, to ensure that a correct diagnosis can be made, as many of these conditions can have visually similar symptoms. Once these have been ruled out, many vets often then suggest blood tests in an attempt to identify the allergen responsible, however Sue Paterson considers these tests to be at best inconclusive and at worst a very expensive waste of time and money! Therefore Sue recommends the second stage as being the trial of a restricted diet whereby the dog is given only a specialist food, usually one containing hydrolised protein, for 3-4 weeks. If any dog is referred to her consultancy practice without having been trialled on such a diet first, she sends the owners away to do exactly that. There are several such proprietary diet foods on the market, made by different manufacturers, but a homemade diet could also be used, so long as the protein sources as less common such as duck,rabbit, or fish being of choice. Such a homemade diet must also not include grains, but certainly a carbohydrate such as potato could be incorporated, there are indications that rice is now casuing reactions too. Understandably, many owners may choose to trial a BARF or raw food diet at this stage and often see improvements in the dog’s condition, but again, less common protein meats should be used. Atopy is a common allergy condition seen by vets and dermatology consultants and typically presents in several parts of the dog’s body and often is an overall rash with hair loss and red, inflamed skin. One consultant defines the conditions as “an inherited pruritic skin disorder characterised by the production of allergic antibodies to environmental allergens”. Atopic dogs have a differing skin structure to non-atopic dogs and their skin allows allergens to penetrate and cause a reaction. In most cases the dog will display symptoms in at least 2 areas of the body, but in 10% of cases the dog will only have symptoms in its ears, but often the dog will chew its feet and rub its face and scratch its ears. Atopy is further complicated as it often presents with a secondary condition such as bacterial or fungal infections as well, such as malassezia. Once again, diagnosis is made by first ruling out other causes such as parasites and infections. Although atopy is an incurable disease, much can be done to control and eliminate the symptoms and therefore improve the dog’s quality of life. On a basic level, minor cases of atopy can be managed using antihistamine (now available from most supermarkets and chemists without prescription) and natural supplements such as evening primrose oil, starflower oil and salmon oil or with proprietary products such as Yumega. For more advanced cases there have been great strides made in the field of immunotherapy, whereby a vaccine is created for the dog and targets that dog’s specific allergens. Interestingly we have very few skin conditions, allergies or ear problems in the kennel. There is obviously no scientific proof but our diet of Bonaforte's Complete coupled with 20ml of olive oil daily seems to keep them in good condition. We also add some coconut oil to their diet too and worm on a very regular basis. Irish Wolfhound puppies and indeed puppies of any breed can be quite a handful, racing around the house and garden without any concern for their own wellbeing and Irish Wolfhound puppies are no exception. There will be numerous occasions over your puppy’s growing months (up to 12 months of age at least) where they initially appear to have hurt themselves, only to carry on running around like a lunatic a few seconds later. As already mentioned on the ‘Big Do’s and Dont’s Sheet’ (see http://www.bonaforte.com/irish-wolfhound-dos-and-dont/) Irish Wolfhound puppies need to be supervised and restricted in their activities and their diet to avoid strains, injuries or unpleasant medical conditions, but occasionally they will still develop physical problems. The most common issue with puppies that owners worry about is lameness or the puppy limping on one or sometimes more than one leg. Often this is nothing more than the puppy having ‘overdone’ things, but any persisting lameness (puppy being lame for a day or more) needs to be dealt with. A lame puppy should be immediately rested (crated if necessary) and then taken to a vet for examination. When resting the puppy they must not be allowed to exert themselves, play with other dogs or be left outside unsupervised, ideally take the puppy outside on a lead for pee’s and poo’s. Lameness can be a symptom of several conditions, some of which are very serious and require urgent intervention, so NEVER delay in getting to the vets as soon as possible, especially if the puppy appears to be very unwell and/or in pain. Speaking to the puppy’s breeder or other owners is fine for general support and advice, but it is NOT a substitute for veterinary treatment! Panosteitis is an occasionally seen long bone disease in large breed dogs. The most commonly affected bones are the radius, ulna, humerus, femur, and tibia, though the foot and pelvic bones may also be involved. It manifests with sudden, otherwise unexplained pain and lameness sometimes shifting from leg to leg, usually between 5 and 14 months of age. Signs such as fever and weight loss, and symptoms such as anorexia, and lethargy can also be seen. The cause is unknown, but genetics, stress, infection, metabolism, or an autoimmune component may be factors. It has also been suggested that rapid growth and high-protein food are involved in the pathogenesis. If pano is the diagnosis, don’t worry, as it is a self limiting condition, which means it will go away on its own in time, often without any further veterinary intervention, and the least threatening of the developmental orthopedic diseases. In some cases the vet may prescribe medication to make the dog more comfortable, such as NSAID’s (non-steroidal anti-inflammatory drugs) and will almost certainly advise that the puppy be rested until the symptoms subside. There is no known way to avoid the possibility of pano occurring, but certainly the risks can be reduced by following the advice on diet and exercise already given. Often it is caused by feeding too many calories than needed, or eating a poorly balanced diet. The condition can be stopped quicker by slowing the growth rate with an appropriate quality food in measured amounts. The problem with pano symptoms and the reason we stress that the puppy must be seen by a vet, is that the same set of symptoms could also be caused by other conditions, including HOD/MO (hypertrophic osteodystrophy, also known as metaphyseal osteopathy), discospondylitis and osteomyelitis. If your puppy displays strong signs of being tired and limp, won’t eat or drink, has a temperature and is limping then any one of these conditions, plus a whole host of others, could be responsible and you must use your common sense and make a decision to seek treatment. Please remember that pano is fairly common, will go away on its own and generally does not cause any long term problems for your dog. Just being aware that panosteitis exists and the importance of a correct diet can help.